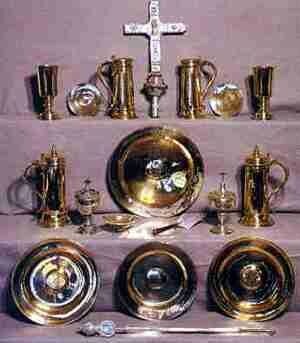 All Hallows possesses some outstanding silver gilt Communion Plate. The photograph depicts the combined plate of All Hallows and St Dunstan's in the East. The All Hallows plate is 1626, St Dunstan's is 1633. The silver crucifix is 16th-century Spanish - a gift to the church. The silver trowel was used by HM Queen Elizabeth The Queen Mother in 1948 to lay the foundation stone of the present church. The Verger's staff from St Dunstan's in the East is a magnificent Georgian piece dated 1821.